Save by combining your accommodations and airfares. Expedia has loads of outstanding Nice holiday packages that'll save you time and give you more cash to spend! Smart travellers who secure a package deal on Expedia can save as much as 59%*. You won't need to search through a bunch of websites for your travel bookings. With more than 400 partner airlines and 321,000 properties around the world, our extensive database has everything you need. Almost all accommodations can be cancelled without any extra charges from us. There are stacks of fantastic things you can do when you're somewhere new. So why not get your trip to Nice off to a great start by checking out some of our recommendations? After all – out there starts here! You're going to find yourself surrounded by terrific sights, such as Cours Saleya and Villa Kerylos. If you really want to make the most of your urban adventure, be sure to drop by Villa Ephrussi and Nice Etoile Shopping Centre. The intimacy and artistry of theatre is difficult to ignore. Purchase your tickets for a performance at Nice Theatre and experience its charm and magic for yourself! There's a fabulous range of things to keep you busy in this destination. Castle Park is a well-liked haunt for locals and tourists alike. Allocate enough time to roam about and uncover everything this precinct has to offer. Still got some time on your hands? Put down your history journals! See the past come alive at Marc Chagall National Museum. Lounging on a beach doing not much at all is nice and all, but there's nothing like diving into some new and fun experiences on your holiday! For the entire list of options, go to our Nice things to do page. With as many as 220 accommodations in Nice, searching for a place to stay won't be a drama. But why waste time? Book now via Expedia and kick off your next cheap holiday or luxury getaway. 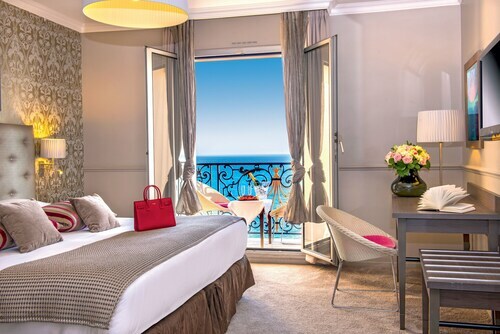 Nice's premium choices such as the Grand-Hôtel du Cap-Ferrat, A Four Seasons Hotel (71 Boulevard du Général de Gaulle) and the Hotel Royal Riviera (3 Avenue Jean Monnet) are sure to please the most discerning traveller. 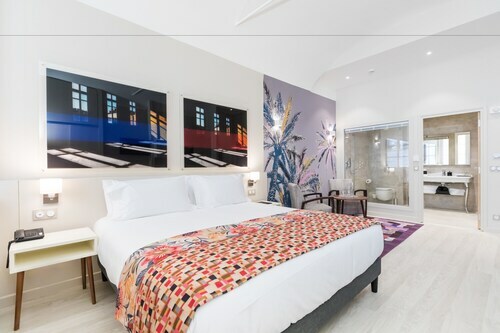 If you're after something a bit cheaper, the Hôtel Le Chaudron (57 Boulevard Maréchal Joffre) and the Les Suites Massena (4 Place Massena) may better serve your needs. Nearly ready for your trip to Nice? Wondering where you'll be flying into? Cote d'Azur Airport (NCE) is your most convenient option. Once you've hit the tarmac and walked out of the arrival gate, you'll be 4 miles (6 km) from the downtown area. Appreciate some of the finest views of Nice from this ruined citadel, which is rich in history and now features a beautiful park. Spend a few hours shopping for souvenirs in the colorful stalls of one of Nice’s most famous markets, which overflows with exotic flowers and local produce. Browse the works of the great Franco-Russian painter at this museum, dedicated to his epic works based on the Old Testament. Get to know the life and works of one of the French Riviera’s most celebrated artists at this superb Nice museum. Explore a world of drama, from ancient theater through Shakespeare to modern puppetry, at one of Nice’s top cultural institutions. Marvel at masterpieces by Warhol, Lichtenstein and Deschamps at this modern art museum, housed in an eye-catching building with glass passageways. Watch sports at the highest level at Nice’s premier stadium, where you can attend soccer and rugby matches as well as concerts and shows. Admire the ornate Baroque architecture of this large and beautiful cathedral, which was built over several centuries beginning in the 1600s. There’s no castle at the top, but the hill overlooking Nice offers views across the city and sea, historic ruins, and a quiet place to escape the heat in summer. Nice’s main square offers opportunities for shopping, delightful cafés dotted around the edge and some of the best people-watching in the city. This fabulous stretch of coastal walkway provides visitors with a stunning view across the Bay of Angels and access to the many beaches along the way. Located in Nice City Centre, this luxury hotel is steps away from Blue Beach and Promenade des Anglais. Place Massena and Cours Saleya are also within 15 minutes. Massena Tramway Station is 9 minutes by foot and Opera - Vieille Ville Tram Station is 12 minutes. 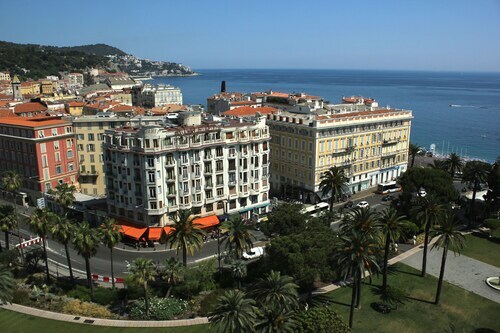 Located in Nice City Centre, this family-friendly Nice hotel is steps away from Blue Beach and Promenade des Anglais. Place Massena and Cours Saleya are also within 1 mile (2 km). Massena Tramway Station is 15 minutes by foot and Opera - Vieille Ville Tram Station is 17 minutes. 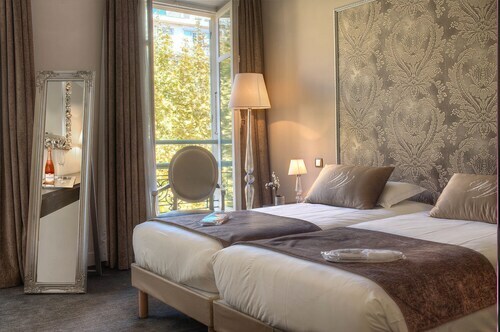 Located in Nice City Centre, this hotel is within 1 mile (2 km) of Avenue Jean Medecin, Place Massena and Cours Saleya. Nice Acropolis Convention and Exhibition Center and Castle Hill are also within 2 miles (3 km). Jean Medecin Tramway Station is 9 minutes by foot and Massena Tramway Station is 9 minutes. Located in Nice City Centre, this hotel is within a 5-minute walk of Blue Beach and Place Massena. Cours Saleya and Castle Hill are also within 1 mile (2 km). Opera - Vieille Ville Tram Station is only a 5-minute walk and Massena Tramway Station is 5 minutes. Located in Nice City Centre, this hotel is steps away from Avenue Jean Medecin and Place Massena. Cours Saleya and Nice Acropolis Convention and Exhibition Center are also within 15 minutes. Massena Tramway Station and Opera - Vieille Ville Tram Station are within a 5-minute walk. Located in Nice City Centre, this hotel is steps away from Courthouse Square and Cours Saleya. Nice Opera and Place Garibaldi are also within 10 minutes. Opera - Vieille Ville Tram Station is only a 2-minute walk and Cathedral - Vieille Ville Tram Station is 4 minutes. Located in Nice City Centre, this hotel is steps away from Blue Beach and Promenade des Anglais. Place Massena and Cours Saleya are also within 15 minutes. Massena Tramway Station is 12 minutes by foot and Opera - Vieille Ville Tram Station is 13 minutes. 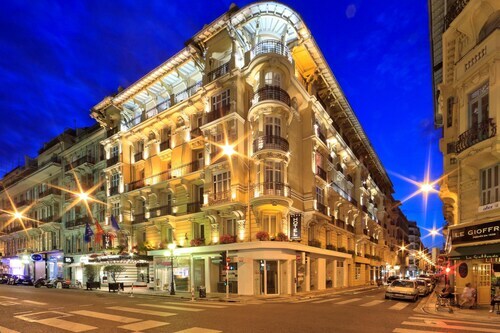 Located in Nice City Centre, this luxury hotel is steps away from Avenue Jean Medecin and Place Massena. Cours Saleya and Nice Acropolis Convention and Exhibition Center are also within 1 mile (2 km). Jean Medecin Tramway Station is only a 5-minute walk and Massena Tramway Station is 6 minutes.